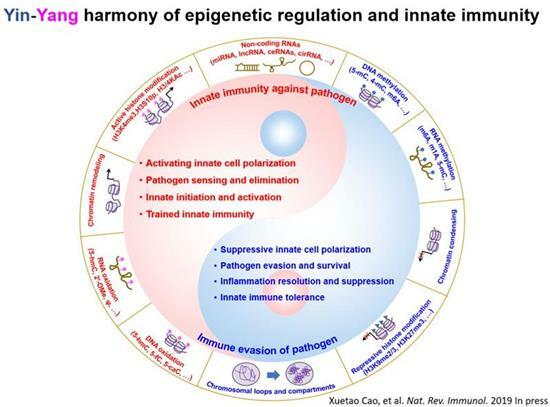 On 27th March 2019, the group led by professor Xuetao Cao in Nankai University published a Review paper titled “Epigenetic regulation of the innate immune response to infection” in Nature Reviews Immunology, which clarified the representative studies of roles of epigenetic regulators in modulating innate immune response and inflammation during pathogen infection. Epigenetic regulation focuses on establishing cell-specific chromatin status to conduct changes in phenotype without genotype variation, which playing critical roles in regulating varieties of physiological and pathological processes. Innate immune responses play essential roles in protecting the host from pathogen infection. Both activation and memory formation of innate immune cells during pathogen infection are changes in phenotype without changes in genotype caused by changed gene activity, e.g. transiting from naive immune cells to activated immune cells or memory immune cells caused by changed activity of immune-related genes, which precisely maintains the balance of innate immune response for effective eliminating pathogens and avoiding tissues damage due to excessive inflammation. Thus, epigenetic regulation is largely implicated in innate immune response to infection. In this Review, the author discussed studies revealing the epigenetic mechanisms as well as chromatin modifier-mediated post-transcriptional and -translational modifications underlying the establishment of both innate signaling networks and rapid induction of innate molecules during infection. Furthermore, representative studies revealing how pathogens use their own products to target host epigenomes for immune evasion and survival are also discussed. Interestingly, the authors also describe the crosstalk between epigenetic regulators and new modulators, such as inflammation-specific metabolites, and the future directions to further deconstruct dynamic chromatin patterns and identify critical chromatin modifiers of pathogen–host interactions.